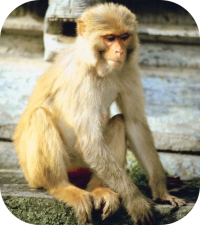 Monkeys are members of the primate groups: Old World monkeys and New World monkeys. Almost monkey species are tropical or subtropical, and almost all are diurnal. Most monkeys are arboreal. They can sit upright and stand erect. There are approximately 264 known species of Monkeys in the world. Size: The smallest monkey is the Pygmy Marmoset at 4.6 to 6 inches in length and weighing only 3 to 5 ounces. 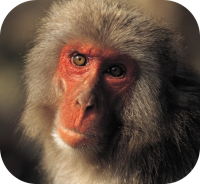 The largest monkey is the Baboon at 3.6 feet tall and weighing up to 80 lbs. 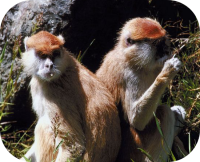 Habitat: Old World monkeys are found in Africa, central to southern Asia, Japan, and India. 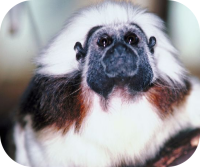 Old World monkeys are found in rain forests, islands, steppes, mountains, and savannas, depending on species. 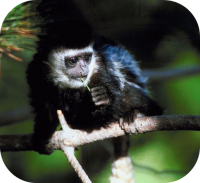 New World monkeys are found in Central America and South America, except for the very high altitude mountainous regions. 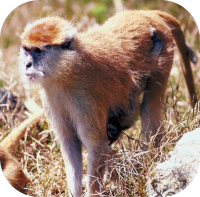 New World monkeys prefer the tropical rain forests and scrublands. Behavior: Monkeys have many different adaptations, depending on their habitat. Most monkeys are arboreal but some like the macaques and baboons are terrestrial. Diet: Monkeys eat fruit, grass, leaves, eggs, insects and spiders, depending on the species. Communication: Monkeys use vocalizations, facial expressions, and body movements to communicate. Monkeys also have their own unique set of fingerprints just like humans. Birth: Newborn monkeys are helpless at birth. 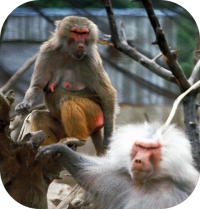 Sexually Mature: Monkeys sexually mature from 18 months to 8 years, depending on the species. Life Span: Monkeys have a life span of 10 to 50 years depending on the species. Social Structure: Groups of monkeys are called troups. Monkeys are very social animals. Monkeys express affection and make peace with others by grooming each other. Grooming helps monkeys keep their fur clean of dirt, dead skin, and parasites, but it also helps them to build social relationships.